The idea that we must return ourselves to our true place in the matrix of nature is an indisputable one for our times as we experience the threat of global warming and destruction of the ecosystems which sustain us. Thomas Sanfilip seems to have a profound feeling for the power and beauty of “Nature” which he always capitalizes in the Germanic mode, as if to deify it with supreme importance-a magnitude which it indeed holds for all. From the poet’s black Sicilian hair to his homage to Whitman, his harkening to city life, in New York, in Chicago, his invitations to the simple pleasures of coffee and sweet rolls, his adoration of sunlight and sea, to time and space, we feel his intense desire to communicate his philosophical meandering and his longing for profound love. We travel through his pages full of his effort to poeticize his own being. Sanfilip is replete with himself and his own thoughts and memories, in love with “bowls of fruit brought at morning./When plums spirits raced, sun fell blue, soft. /Butterflies mounted frangipani, fat-leafy flowers./ Blossoming orange wings.// I loved memory/The hands of my mother’s doing work, pinning/billowy white sheets to dry in springtime,/kneaded dough, seasoned meat, pepper, garlic, salt./Father his acrid pipe. Summers under an apple tree, every branch white flowers./His accordion, guitar, song, sporadic and lost….” This poet is at his best when he foregoes philosophy and lives fully in the descriptive moment with all its sensual and most natural joys. Question: How has humanity traditionally created a life for itself without logos? Bigger question: How does humanity live in this new world with its constantly shifting mythos of good cheer and vapid interior? 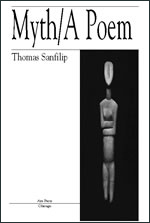 Divided into five sections and running over a hundred pages, Myth/A Poem by Thomas Sanfilip is the first volume of an extended poetic work that addresses such questions. The result is often compelling, sometimes disturbing, always intense poetic discourse that will likely be an affront to pure esthetes who want to read fancy words but don’t want to tackle complex social and emotional issues. Sanfilip establishes more than a persona in Myth. His reflections on life are more than therapeutic. He truly lives each moment in order to record it. His voice is personal and assured, not cryptically encoded. Even as he holds up the tactile world before us, he brings us back to the schemata of his own myth. Lines early in Book I such as “Flower of my self-doubt” and “Writer of words I distrust of their symbolism” on the surface reflect an arrogant refusal to build a mythos, but are ingenuously designed to show the power of our own self-appraisal. For me, however, Myth begins to evolve by the middle of Book II. The poet finds a happy medium between his love of all things constant and life-affirming and the expression of his unique philosophy. He keys into his own life’s value, with an allusion to ancient Greece, an ideal he uses often as a template to hold against the failures of our age. However, in Book IV, I find a shift to a vaguer, less intense lyricism, seemingly coming from Sanfilip’s desire to encapsulate the tyranny of politics and left wing constructs in 20th century art and society. Here the poet offers us his mordant summation of a semantic-ridden race of educators and artists, all looking askew at nothing but the idea of art and the pain that is supposed to go with it. Through it all, Sanfilip offers us the idea of singularism as another way to view life. Certainly a more distinct word, more inviting than individualism, and less threatening. As poets go, Sanfilip refuses to cave in to the notion that life need be a mad struggle to break down the living soul. The soul is self-evident. At times, Sanfilip’s words work against one another in a stony, illogical forward motion, but the underpinnings for a great long poem always surface and restore order. There may have been a need for less discourse in some sections, but the intense flavor of originality is always a pleasure in poetry that aims for as grand a design as this, in its own way as persistent as Crane or Whitman.To Sanfilip, the present world order needs to die in order for humanity to gain true mythic stature in history. In all respects, Myth attempts to persuade the reader that all the accoutrements of living are defunct and useless, that we only have ourselves and our memories; and that symbols, like a raging cancer, strangle us in their bland attempt at inter-connectedness. For those who want some unflinching truth, I predict Myth will earn its keep as we move further into the new millenium. Walt Whitman’s greatest achievement was to endow a voice with a personality that was not his own, and because he was a vast cathedral of a man, albeit a wholly secular cathedral, he was successfully duplicitous in his effort and subsequently he has wooed thousands of intelligent innocents as adherents to his cause. How innocent the sheep flock close to his robe! How beautiful is innocence! Thomas Sanfilip would continue the sentence begun by Whitman, and certainly he has committed a brilliant assimilation of the personality created upon paper by his predecessor. He captures the tone exceptionally ably, and he transports the effort into the 21st century realistically. Upon the whole, the work here presented is uncannily brilliant and mature and resonant with an apparent depth of thoughtfulness. We are feted with reminders of his emphatic awareness: the poet’s black Sicilian hair, his continual homage to Whitman, his awareness of Chicago, New York, his frequent invitations to our bellies’ delight with mention of coffee and sweet rolls, invitations to our love of the sunlight gently handed us. Many books may be written about this book.